This tiny nation has been pushed off a cliff to "save" the eurozone. Reunification may be the only way to turn the island's fortunes around. In Cyprus’s divided capital, the early symptoms of the familiar plague are plain. There’s the rash of For Rent and 50% Off signs, scattered still but spreading; the numb, unnatural quiet; the melancholy of shop windows full of things no one will buy. On classy Makarios Avenue, Guess Jeans, Juicy Couture and Planet Organic survive from the cosmopolitan boom time, but the Nike outlet has closed. The pavement opposite is strewn with leaflets from ELAM, the Greek neo-Nazi movement’s small Cypriot franchise. The town center is packed with what one Cypriot called “crowds of indignant journalists” waiting for the sky to fall; in the vegetable market, a widow who lost her catering job six months ago sits hunched by a folding table piled with sesame bread. She got the flour from the church, she says; she was up baking all night and hasn’t sold a single loaf. Today was her last hope. 60 percent of holdings over 100,000 euros (about $130,000 at today’s exchange rate). This will not only affect the Russians, British, Germans and other foreigners drawn by low taxes, loose rules and high interest rates to base their companies and stash their money here, but every Cypriot with a medium-sized business. Until mid-March, banking and financial services were the engine of the island’s economy, accounting for about half of it; now, with confidence fried, the car will be stalled for years. Economists predict a 10 percent decline in GDP and a doubling of the unemployment rate, currently at 14 percent, in 2013 alone. This is not creeping austerity but sudden death: a tiny nation pushed off a cliff to “save” the eurozone—or at least German Chancellor Angela Merkel’s fall re-election prospects. Most Cypriots I spoke with have few illusions about their elites’ share of responsibility for the mess. 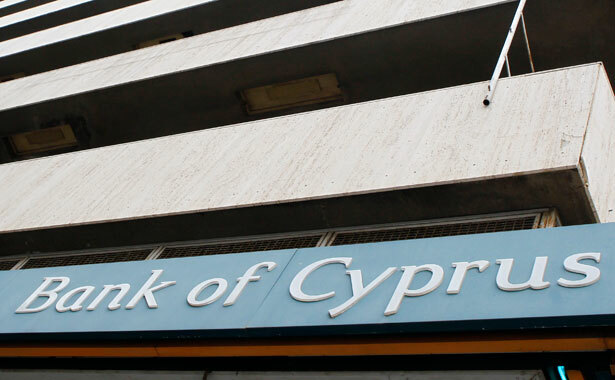 After 1974, when the island was split in two by a Greek fascist coup followed by a Turkish invasion, the (Greek Cypriot) Republic of Cyprus turned itself into an offshore banking center. Money came in from the Middle East and, in the 1990s, from the former Soviet Union. When it entered the EU in 2004, Cyprus became an even more attractive destination. But the banks were badly managed, taking bigger and bigger risks. The communist party, AKEL, in power from 2008 until February, ignored repeated warnings from the EU and IMF and dragged its feet on negotiating a bailout agreement, placing too much faith in Russia—which has so far refused to add to its existing loan of 2.5 billion euros. Then there’s the Greek connection, which has distorted Cypriot life and politics for years. “Cyprus always helped Greece,” an old man, a refugee from the north in 1974, said to me. “Alexander the Great came here, we gave him ships, we gave him everything. We said, ‘We’re Greeks.’ Since then—what, two thousand years?—this lousy place has suffered for the ‘mother country.’” By the end of 2010, Laiki and the Bank of Cyprus held 5.8 billion euros of Greek government bonds, worth a third of Cyprus’s output; after last year’s Greek haircut, they’d lost 4.3 billion of it. A Greek oligarch, Andreas Vgenopoulos, held a controlling share of Laiki until last year; under his chairmanship, the bank made some 12 billion euros’ worth of risky loans in Greece, including a fat tranche to a Mount Athos monastery engaged in a dodgy land deal with the Greek government. But Cyprus is not the only eurozone country with a large, lax banking sector; there are also Malta, Ireland and Luxembourg, where banking is worth twenty-four times that tiny duchy’s GDP. Nor was the Cypriot economy as a whole considered unsound; just eighteen months ago, the IMF was making rosy forecasts for its future. Everyone expected some austerity, but no one imagined that the ax would fall like this. The usual moralistic rhetoric from Brussels and Berlin has added insult to injury. Yet the response so far has been surprisingly restrained. At a protest outside the presidential palace (until 1960 the British governor’s residence) organized by a new Citizens’ Movement Against Privatizations (which draws support from AKEL, trade unions and others), a few thousand people stood around, waved Cypriot flags, listened to music and speeches, chanted slogans and went home. To a veteran of Syntagma Square in Athens, it was amazingly dignified: no stones, no riot police and no tear gas (yet). Reduced to slogans, the links seem dangerously simplistic; but they are real, and vital. Coveted for centuries by every pushy power with an eye on the Middle East, Cyprus was finally torn in two by the Cold War. Since then, its development has been lopsided: the north, recognized only by Turkey, languished under occupation and economic isolation while the south prospered. But after 2004, when Turkish Cypriots accepted and Greek Cypriots rejected a UN plan for federation days before the Republic’s entry into the EU, the balance began to shift; European money began to trickle into the north as well, in recognition of the Turkish Cypriots’ willingness. Now the seesaw has flipped. Turkey is booming, and its new understandings with Israel and the Kurdish leader Abdullah Ocalan have strengthened its new role as a regional superpower. Natural gas under the Mediterranean south of Cyprus is a catalyst for conflict—or cooperation. The obstacles are huge, but people from both communities see reunification as a possible way to turn the island’s fortunes around—and heal a decades-old rift in a city, a country and a continent. Earlier this month, Mark Mazower surveyed several books on the debt catastrophe in Greece, another country rocked by the ongoing eurocrisis.